In between a pre meet shower on Friday and a threat of rain and Saturday’s end the BVI Athletics Association National Youth Championships—which also celebrated the 21st IAAF World Athletics Day—Ariyah Smith led the territory’s top U15 athletes and visiting athletes from St. Croix, with four victories. 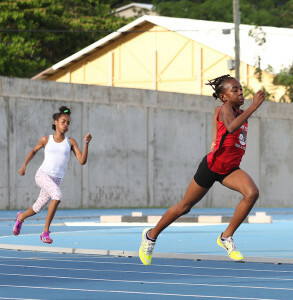 Khybah Dawson and A’Sia McMaster pulled of trebles and nine athletes were double winners in the competition that had most of the athletes opting to represent their clubs, with St. Georges and Joyce Samuel the two schools fielding teams. Smith’s quadruple came in the U13 Girls events with victories in the 200m in 27.64 seconds; a 27.50m Baseball Throw, a 1.25m High Jump clearance and a 4.10m flight in the Long Jump. Khybah Dawson, after a second place finish in the U13 Boys 100m behind Kyron Walwyn’s 13.17 seconds with 13.34, went on to post his treble with a Long Jump personal best of 4.98m, then tied Sha’el Lavacia’s 1.45m clearance in the High Jump, before wrapping up his winnings with a 27.37 seconds 200m triumph. A’Sia McMaster secured her U11 Girls triple with narrow sprint victories over Kayla Bratwaithe, 11.86-11.92 seconds in the 100m and 22.73-22.78 in the 150m. She completed her work after cutting the sand at 3.57m in the Long Jump. Zara Brown, a 2018 Youth Olympic Games prospect, secured an U15 Girls 12.64/26.03 seconds sprint double, while her counterpart Xiomara Malone was second in both sprints in 12.85 and 26.67, before notching her own double of 1.60m in the High Jump and 4.97m in the Long Jump. Malik Smith sprinted to 11.65 and 23.83 seconds for his U15 Boys double, while Kyle Leader cleared 5.20m in the Long Jump after a 51.30m effort in the Baseball Throw. Jahtivyah Williams’ U13 Girls double came with triumphs in the 300m in 45.26 seconds and one minute 55.23 seconds in the 600m. Tiondre Frett topped the U9 Boys sprints, taking the 60m in 9.38 seconds and the 150m in 23.34. Jayla Winter with the same events in the Girls division with marks of 10.00 and 25.67 seconds respectively. St. Croix siblings Tyrone and T’Yanna Lake, won two events respectively and grabed top three finishes in their other events. Tyrone won the U11 Boys Baseball Throw with a 48.60m effort along with a 1.25m leap to secure the High Jump. He was third behind Kaleem Lettsome in the 80m, which Lettsome won in 11.46 secnds to his 11.51. Lettsome completed his double with a 21.41 seconds run in the 150m, with Tyrone placing second in 21.64. Lettsome—who has never lost a sprint final over the last four years—was second in the Long Jump after cutting the sand at 3.42m. Tyrone had a 3.33m jump in fourth. T’Yanna who also plays baseball along with her brother, won the U15 Girls Baseball Throw with a 44.44m effort and took the Shot Put with a 5.46m heave. She was third in the Long Jump after a 4.36m leap.